يشكل فندق Quest on Queen Hotel بموقعه الممتاز في قلب هذه المنطقة الرائعة كنقطة انطلاق ممتازة لاستكشاف المدينة. يسهل الوصول إلى هذا الفندق ذو 4 نجوم من المطار، فهو يبعد عنه مسافة 24.0 km فقط. إن سهولة الوصول من الفندق إلى المعالم السياحية الشهيرة الكثيرة في المدينة هو استثنائي بحد ذاته. إن الخدمات الممتازة وحسن الضيافة العالي في Quest on Queen Hotel تجعل إقامتك تجربة لا تنسى. يقدم هذا الفندق العديد من الخدمات الكفيلة بإرضاء أكثر الضيوف تطلباً. بالإضافة لهذا، تتضمن كل غرف الضيوف مجموعة واسعة من وسائل الراحة . بعض الغرف توفر حتى تلفزيون بشاشة مسطحة, غرف لغير المدخنين, مكيف هواء, تدفئة, مكتب لإرضاء أكثر الضيوف تطلبًا. صممت خدمات الاستجمام في الفندق والتي تتضمن مسار جولف - ضمن 3 كم لمساعدتك على الاسترخاء والراحة. إن Quest on Queen Hotel هو مكان مثالي للمسافرين الذين يتطلعون إلى الراحة والاستجمام في المدينة. يُطبق رسم إضافي على كل معاملات البطاقة الائتمانية. بالنسبة للنزلاء غير القادرين على تقديم بطاقة ائتمان سارية، سيقوم مكان الإقامة بإجراء حجز مُسبق لبطاقة الخصم أو سيحتاجون إلى الدفع نقدًا مقابل 200 دولار نيوزيلندي عند تسجيل الوصول وإلغاء الحجز خلال 3 أيام عمل بعد المغادرة. Expected more given its location and how it was advised. ‘Staff’ greeted us wearing sandals, socks and casual wear (afternoon on a Saturday). Check-in counter appeared to be a broom cupboard. Was sold a an apartment with ‘city views’. The only view was the back of the building behind the hotel. The room was also above the licence premises so had to listen to loud music and people yelling all night. Been here before with my partner and it was such a great time that we decided to go there again for our 4th year anniversary. Didn't get the room we wanted but it was still great... Love it here.... especially cause the kitchen is fully stocked with all the right cooking utensils etc.... but to top it off the rooms itself and bathrooms are lovely. Can't wait to book here again. The location is fantastic, less than 5 mins from airport transportation and right at the heart of Queen Street, very close to the ferry terminals, food places and everything. The best part is that the apartment is very quiet at night despite being so close to pubs and the main street. (I was staying at somewhere nearby and the noise can get seriously loud at night) The apartment itself is spacious, clean, tidy and bright. Water pressure is great and it definitely has everything you need. The staff was very friendly and very accommodating when I checked in late at night. This place exceed my expectation. Great location - close to port/train and amenities. Staff and management very friendly and attentive and helped make our stay very enjoyable. Nice room with everything you needed and nice balcony. Great location, easy walk to sky tower & harbour. Good food options & shopping if you fancy. Only down fall was we stayed Friday & Saturday night which was very noisy night life till 3am. 9th floor and could hear everything below other than noise great ! good comfort, friendly staff, adequate facilities, good value for money. location is perfect because it's in the middle of everything, bad if you require parking, basically a battle against all the cars on Queen Street. For us, it was all about the location. Perfect. Walking distance to everything we wanted to see. Places to eat were all over. Secure access to the building was comforting. The washer and dryer in the room was such a blessing. We cleaned almost all our clothes while we were there. Plenty of room to spread out. It felt like a small condo and not a hotel. Wait a minute, it WAS a small condo. Be aware there are TWO Quest on Queens on the same street and we learned the taxi drivers frequently drop you at the wrong one. Give the driver the address even through he says he knows exactly where to go and not to worry. A convenient spot. Despite the loud neighbors having a party - which was against policy - it was a good place to stay. I would stay there again. 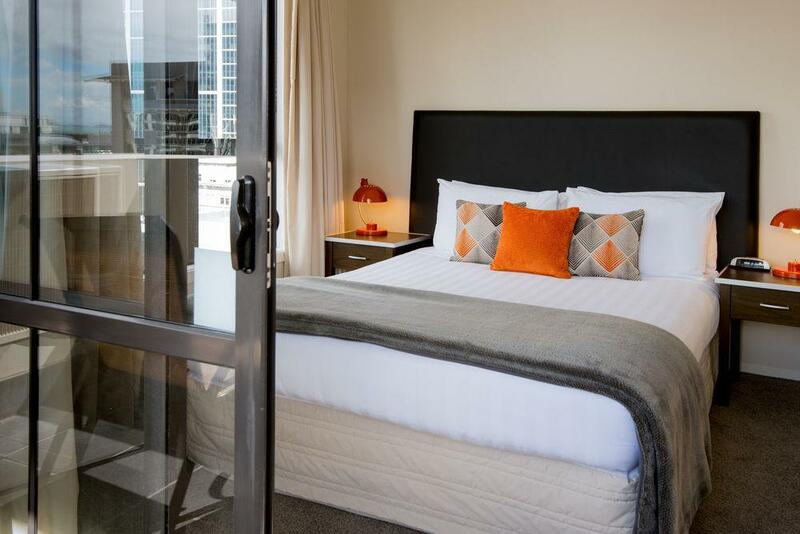 2nd time I’ve stayed here, as the Rooms are mini-suites really, with all the facilities you need for a very comfortable stay, in a great location in the CBD. Only downside is the building work going on where the shopping mall used to be, and the workmen start really early, but didn’t detract from a very comfortable and enjoyable stay. The apartment was fantastic. It had everything you could possibly need: microwave, oven, hob, dishwasher, iron, hairdryer etc... The location was extremely convenient. The airport flyer bus stops down the street about a 5-10 minute walk. The price was great compared to other hotels around. I put 3 stars for value for money but Auckland is expensive in general. Needed somewhere central to stay in Auckland City Centre that had decent tourist access and proximity to bars & restaurants. It did tick those boxes...hotels in Auckland are not the best value for money generally and this more Serviced Apartment concept works OK. Downside was no staff to greet us on arrival and help check in. Also was close to nightclubs and the noise was really audible until the early hours (I could actually name the songs that were playing, it was that loud). The bed was hard, the toilet kept blocking, the door handle fell off (that did get fixed eventually) the bathroom needed a good scrub from top to bottom, however the staff were friendly and the location was great. I had pleasant stay , would like to visit again. Unfortunately the pendant of being centrally located is the noise. In spite of being on the 8th floor the open air night club just below played really loid music until past 2 am and it is impossible to sleep... It is totally independant from the hotel but the purpose of it is to sleep there.... So if hardly any sleep possible until 2 am, there is no point. They kindly offer ear plugs but even with these you can still hear the loud bass of this night club. Not a great experience which is unfortunate as the appartment itself is ok with a nice little balcony. 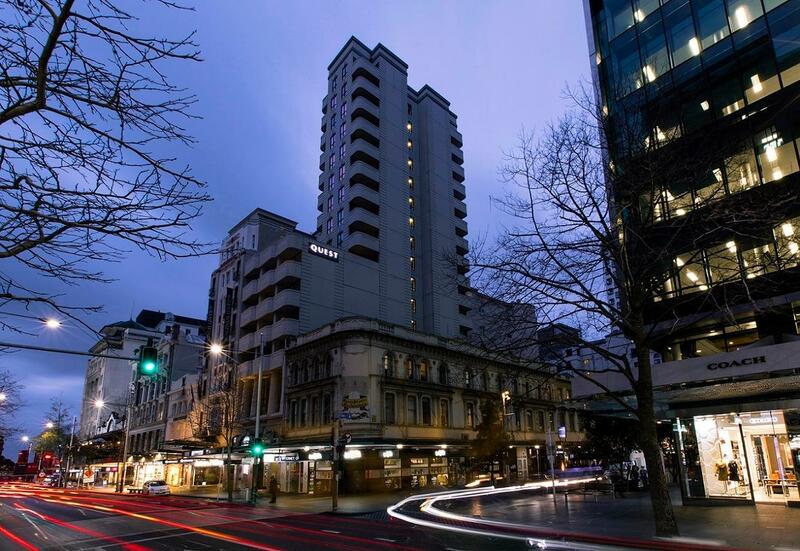 I usually stay here when I am visiting Auckland on business, is always good value and a good location... This time I did have issues with the Hot water in the mornings, for which I mentioned twice to reception but was never updated, and the TV reception was a bit static, but as I have never had this before I am not making a big deal of it. Good, but there was no reception after Eight. I left the luggage in the Lobby because they didn't have the room ready early morning which is acceptable, but I returned at 9PM, no reception so no luggage. I couldn't change my clothes to go out, or get my toothbrush or shave myself. No phone to contact anyone at night. Maybe I didnt read the small letters, or didn't want to wake up too many people, but there should be someone to contact at night. While the location was fine, management did not take the initiative of dealing with something that was lost in the room after housekeeping did cleaning. I would NOT come back to this hotel. The stay was great, just a little noisy because of World Cup. Easy access to train station and bus station. Very convenient in terms of food and grocery.